Wall removal projects by Toronto Custom Concepts are one of the most commonly requested renovations that our clients are asking us for. With all of the HGTV shows recently focusing on opening up traditional home layouts with separate walled rooms to a more spacious and open concept design, we are finding that folks are looking for a trusted, reputable renovation company to do this type of renovation that must be performed perfectly the first time (as there are no second chances if you improperly take down a load bearing wall). 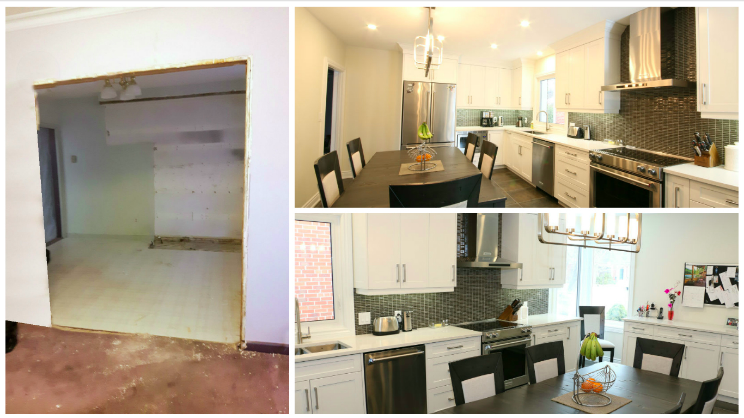 So check out this recently completed project by TCC of a wall removal project in Toronto to open up two separate rooms into a single open concept space with a spacious kitchen. Hope you like the before & after pictures of this wall removal and kitchen renovation project!